01245 227035 where we shall do our best to help. 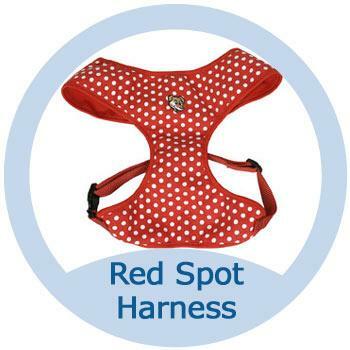 Red Polka Dot Soft Cotton Dog Harness. Soft harness, made from cotton canvas will keep your dog happy on their walks. Adjustable chest strap to ensure secure fit. Nylon webbing for extra strength. Soft fleece lining for extra comfort. X Small - Chest 32-45cm Collar 25cm Suitable for Cocker Spaniels, Shiba Inu Breeds. Suitable for Chihuahua, Yorkies, Toy Dogs.